Did you know you can now order your Deliveroo takeaway from Me Love here on View? 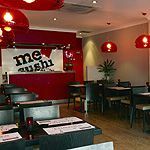 Me Love is a Japanese restaurant and takeaway offering freshly prepared sushi, noodles and much more. Do you work at Me Love? What did you think of Me Love? Nice place, friendly staff and tasty food. For anyone who says it is pricey... take a look around my friends! You get a great meal for the price. One of my fav hangouts. If any cuisine captures the zeitgeist, it is surely Japanese. 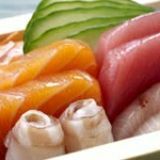 It’s light, healthy, good looking and makes us feel oh-so-sophisticated as we grab our raw fish (which would have appalled our grandparents) betwixt our chopsticks (which would have baffled them). The Edgware branch of this small, casual chain is a good place to gobble up the gunkan and gyoza. 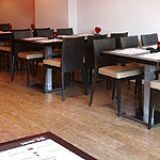 You’ll find this 46-seater a short stroll from Edgware Tube Station in a parade of nondescript shops. Un-clothed tables are modern and of dark wood, chairs are utilitarian but not disagreeably so, and colours neutral and muted save for rather groovy, '60s-style, oversized, pendant light shades. Even on a weeknight, there are plenty of young, casual diners and a nicely relaxed vibe. Service is equally young and casual, and perfectly competent, except for a solitary blip when a dressing is whisked away too soon. It’s also exceptionally friendly: for example, rather than straightforwardly offering knives and forks, a waitress confides she prefers cutlery ('I find it much less difficult than chopsticks'), so no-one who’s a klutz will feel embarrassed - a nice touch. Staff are also keen to advise on good combinations and appropriate numbers of dishes. 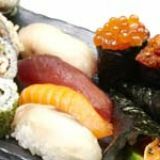 The menu is divided into sections like nigiri, tempura, noodles, and soups and salads. From the uramaki section, rainbow rolls (£7.25) feature raw salmon, prawn, avocado and crab meat mayonnaise, topped with flying fish roe. It’s a fresh (crucially important), creamy, fishy, complex mouthful and looks as good as it tastes. A portion of crispy duck temaki (£4.75), though, is as parsimonious as the rainbow roll is generous. The duck has good flavour, but the cucumber, spring onion and hoisin sauce are a tad polite. 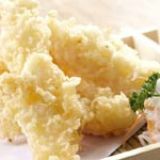 Things are back on track with prawn tempura (£8.25). The crustaceans are juicy and flavoursome, their batter impeccably light and crunchy, and there’s a pleasant Thousand Island-style dipping sauce. The ‘noodles’ section offers something a little more filling, with either soba (thin) or udon (thick) available. Prawn udon (£7.25) is a big, piping hot bowful. However, a mere four, medium-sized prawns sitting on top is a forlorn sight; it needs at least twice as many, and a dozen wouldn’t be unreasonable. There’s not a lot of the carrot, onion, green pepper and beansprouts, either, and most of the flavour lurks in sauce at the bottom of the bowl, so a thorough initial mixing is recommended. All in all, this dish is more filling than thrilling. Chicken teriyaki (£7.75) features tender, tasty, grilled, boneless meat, good glutinous rice but a rather tentative teriyaki sauce. A side salad of rocket and shredded carrot, onion and red onion is welcome, but it’s a shame its moreish Oriental dressing is whisked away moments after it arrives. Is it unreasonably British to wish the dishes didn’t arrive in random order, even though this is, of course, usual for restaurants of this type? It’s hard not to hurry the tempura and temaki when the big noodle and rice dishes are cooling before your eyes. Pudding options have recently been improved and extended. There’s chocolate truffle or strawberry cheesecake (both £5.95), and a quartet each of ice creams and sorbets (£4.25). The individual cheesecake is unusually soft and light with a crisp biscuit base and an accompanying scoop of good vanilla ice cream. Other ice creams also please; chocolate, green tea, and honey and ginger all have clear flavour and perfect texture. Tiny pieces of preserved ginger make the last one the stand-out. The tiny but perfectly serviceable wine list comprises two rosés, three reds and five whites (from £15.50 to £22), plus Japanese plum wine at £25. Commendably, everything is available by the 175ml glass. There are also five champagne and sparkling wine options. The cheapest white, a Los Caminos Sauvignon Blanc from Colchagua Valley, Chile (£3.80/£15.50) is typically citrusy and refreshing. If you did want to spend a little more then a Colombard Chardonnay Duc de Chapelle from France (£4.50/£18), is a modern, unoaked, lemony example that is unexceptional but perfectly passable. As for reds, entry level Shiraz Malbec from Avanti in San Juan, Argentina (£3.80/£15.50) is a rounded, warming, spicy, cherry-stuffed bargain. There are beers, sakes, soft drinks and interesting teas, all at fair prices. There’s no coffee yet, but it is promised soon. You could pop into Me Love Sushi for a rice- or noodle-based main and a beer and be out for under £15 a head. More realistically, you’ll spend about £35 a head on a full meal and half a bottle of wine, which is decent value. This is a useful, unpretentious, neighbourhood restaurant (with a thriving takeaway section, incidentally) and part of a chain of four that will probably keep on growing.